Anvi Smart Defender Pro changes the way you think about anti-malware. Anvi Smart Defender Pro brings crucial anti-virus and privacy protection to your computer and USB drives with One-Click Solution. The newly designed swordfish scan engine, at a fast speed, scans your computer lightly and instantly detects even the latest known viruses, worms, Trojans, rootkits and other malicious software that could harm your computer. It adopts a revolutionary new cloud-based technology to further protect your computer against viruses, Trojans, worms, rootkits and other malicious software. Cloud antivirus is based on our web service that enables users to access to the latest data of malware within minutes. Real-Time Protection provides nonstop security, even between system scans. Web Protection keeps you away from landing on malicious websites. Downloads from the Internet will be scanned right away. Mail protection protects your PC from infected email by giving warning to you before you open it. It also provides system optimization solutions to help your computers run faster. Update center automatically updates the malware database daily to ensure you the maximum protection. Home: Your computer care center for malware detection, removal and prevention. Smart Scan: Smart malware detector to heal infected computer and ensure it stays on the safe side. Cloud Scan: More efficiency on malware detection by uploading suspicious files to cloud scan database. Full Guard: Powerful guard of your privacy, PC running processes, computer files and behavior. PC Tuneup: System optimization strategies provided to make computer stay safer and well-performing. Toolbox: Daily utilities for system maintenance, ads blocking strategies, browser settings repair, etc. 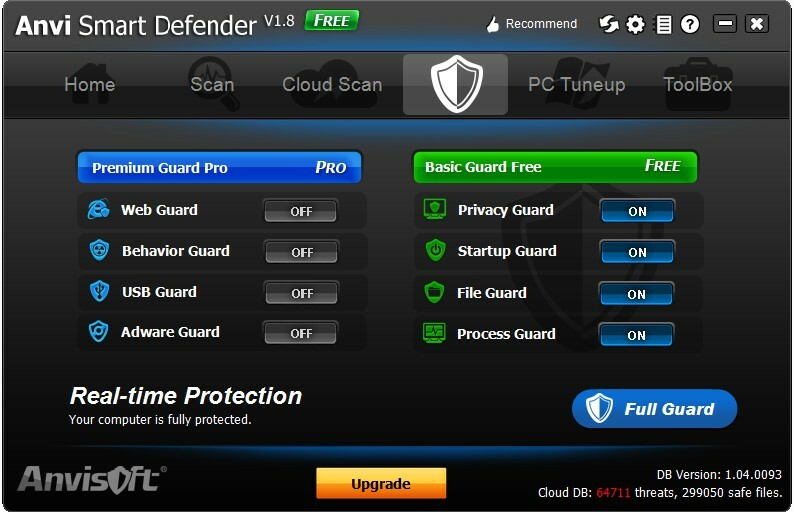 Free version of Anvi Smart Defender Pro can be downloaded using the following link. You can upgrade to the pro version from the free version. 1 year license of Anvi Smart Defender Pro for 1 PC costs $24.98, for 2 PC costs $33.98, for 3 PC costs $39.98 and for 5 PC costs $59.98. The same pricing holds for its renewal. You can purchase 1 year license from this link and 1 year renewal from this link. You can get 60% discount on all the above licenses. Use coupon code ANVI-5P48-BCYP or use the following links.